While capturing weddings is always special, it is even more of a privilege to get to work for friends in the business. As one of our spectacular partners, we were touched when Vito asked our crew to document his wedding. Luckily for us, it was easy to capture the fun and love in the air at their Hard Rock Riviera Maya wedding. 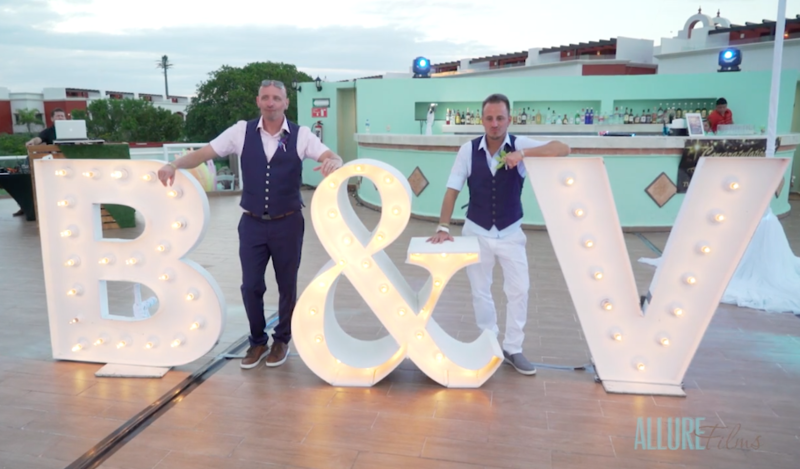 Nothing would capture Vito and Bill’s personalities quite like an over the top beachside wedding. Complete with a glowing dance floor and giant “V” and “B” lit up letters, the wedding turned into quite the party. Hard Rock Riviera Maya gave the couple the perfect space for their dream wedding. As the day turned into night, the newlyweds joyfully celebrated with family and friends. Our crew at Allure Films filmed the day for our friends’ beachside wedding. Vito and Bill also asked our partners at Pictures by Todd to photograph their big day. They captured beautiful and breezy photos of our happy couple enjoying their day in the sun. The two truly do fit perfectly, like Legos, as they both joked about in their vows. While we have known Vito and Bill over the last few years, their friends statements truly showcased the love between them. We are honored to capture their wedding and get to see our friends start the beginning of their life as a married couple. Here’s to a lifelong adventure for our friends, the happy couple! Congratulations Vito and Bill!